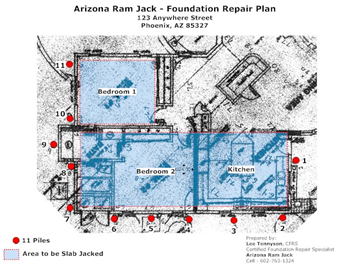 Foundation settlement is one of the leading causes of building damage in the world. 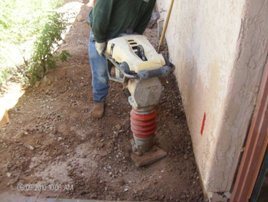 The causes are usually due to moisture changes in the bearing soils. If left unchecked, damage could exceed practical repair abilities. 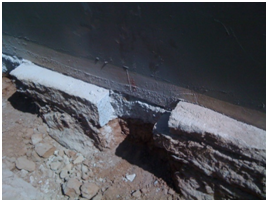 Many of the same symptoms of foundation settlement are caused by the opposite problem...floor or edge heave. 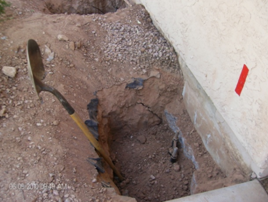 Before a cost effective repair plan can be designed, a thorough analysis of the foundation must be performed, usually a manometer survey is the most effective approach. Once an analysis has been completed, an efficient, cost effective solution can be planned that is backed up by the supporting data. Solutions could include hydraulic piers, helical piers, pressure grouting, mud jacking, soil venting and or cut off walls. 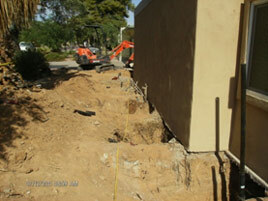 Find out how we diagnose your foundation issues. In some cases we find that the problems are superficial and do not require any major repairs. In any case, we will supply you with the information you need, backed by scientific surveying. You can count on Arizona Foundation Solutions to make an informed decision and repair your foundation the right way. 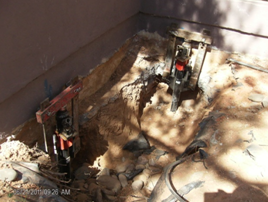 Our patented steel piering or piling systems are installed to depths well below the problem soil. To create the new permanent support for the structure, these rigid columns of high strength steel are attached to your foundation's footing using heavy duty steel foundation brackets. The steel piers are then hydraulically driven to stable bedrock or load bearing strata, and the weight of the structure is transferred to the steel brackets attached to the foundation. 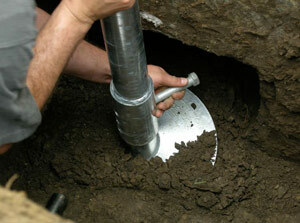 This attachment is below the ground so nothing is exposed once the process is completed. The essence of the technology is using hydraulic rams to deliver up to 70,000 lbs. 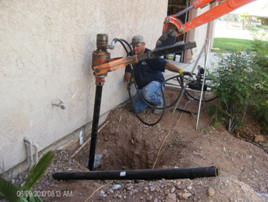 of force to drive a high strength steel shaft down to competent bearing strata, which is around 20 ft. deep in the Greater Phoenix & Statewide area. 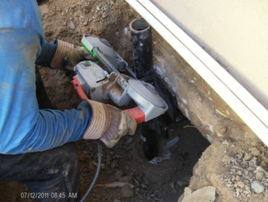 This solution permanently bypasses the problem soils and establishes a new bearing element to which we can stabilize and adjust the existing foundation. These push piers are left permanently in place and covered up so that no trace of them can be seen. Helical piers were invented over 100 years ago for commercial construction and first used in tension applications to hold down cables, then later in compression applications to shore up loads in soils. Helical piers are ideal for lighter loads or pre-construction applications, including earth shoring and tie backs for retaining walls. They are installed similarly the same way as hydraulically driven piers. It's a simple concept, in which a large helical screw called a helix is attached to a shaft and is then turned with hydraulic torque motors. The shaft drills itself down until it reaches refusal at a specific torque pressure. repair plan. This entails doing a proper investigation. 2.) Excavate pits at each location to receive piles. 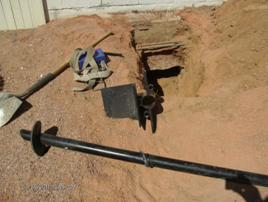 The pits are usually 3 ft. wide by 3 ft. long by 3 ft. deep. 4.) 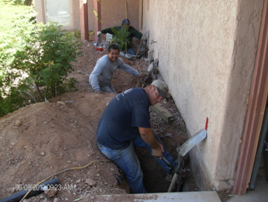 Install pier brackets to the foundation. 5. Drive pile to load bearing strata. This can be a helical pile or hydraulically driven pile. In each case, the pile is driven to a depth where it will lock up in rock or very hard soil so that it can support the structure's loads. 6.) The piles are then cut off to the correct height. 7.) The structure is then hydraulically raised simultaneously. 8.) 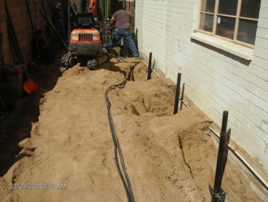 After all the adjustments are made, the jacking hardware is removed and the pits are backfilled and the landscape can be restored.